Happy Spring! I have a hard time believing it is spring. We still have A LOT of snow on the ground. In fact, it's snowing right now. Again. But, if you look carefully, there are a few hints of spring. The bird songs have changed, the animals have started to move, and where the snow has melted about 5 inches from the side of our house, a few brave bulbs are peeking above the ground. I have hope that this never ending winter will end eventually! To celebrate spring, I wanted to share this wonderful, light and colorful dessert. I mean really, lemon just shouts spring! The color itself is just so refreshing. 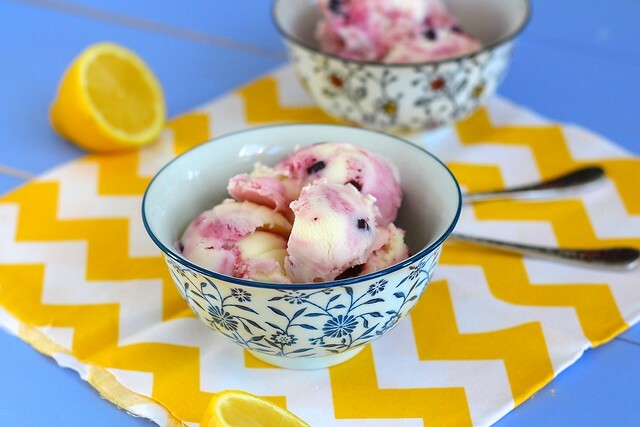 This frozen yogurt is light, creamy and down right delicious. 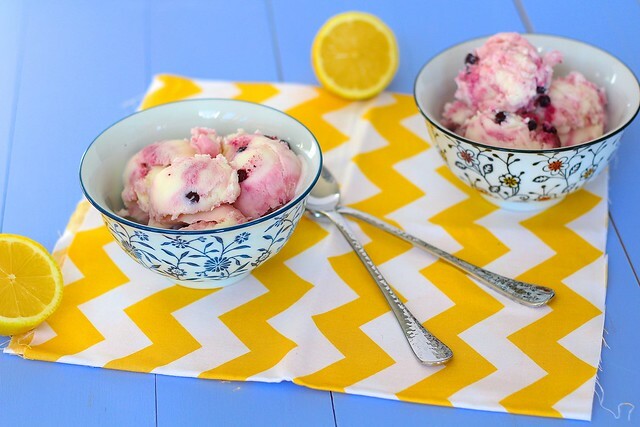 Lemon and blueberry are a match made in heaven. The blueberry swirl is optional, but highly recommended. The sauce doesn't freeze completely, so it makes a wonderful swirl. Go make this today and think of warmer days (or if you are already in the warmth, sit outside with a bowl). For the lemon syrup, zest the lemons (use two lemons if you really like lemon) with a vegetable peeler (that way it is easier to remove later) and reserve the lemons for the frozen yogurt. Juice enough of the lemons to make 1/2 cup. Combine the lemon juice and sugar in a small saucepan and bring to a boil over medium-high heat, stirring to dissolve the sugar. Once the sugar is completely dissolved, remove from the heat and let cool. For the frozen yogurt, mix about 2 tablespoons of the milk with the cornstarch in a small bowl. Whisk the cream cheese in a large bowl until smooth. Combine the remaining milk, cream, sugar, corn syrup and reserved lemon zest in a 4-quart saucepan. Bring to a boil over medium-high heat and boil for 4 minutes. Gradually whisk in the cornstarch mixture. Bring the mixture back to a boil and cook, stirring with a rubber spatula until slightly thickened, about 1 minute. Remove from the heat. Gradually whisk the hot milk mixture into the cream cheese until completely smooth. Stir in the yogurt and lemon syrup until smooth. Cover the bowl with plastic wrap and refrigerate until cold, several hours, or over night. Alternatively, place the bowl in a larger bowl that has been filled with ice cubes and very cold water, creating an ice bath. Meanwhile, make the blueberry swirl. Mix the blueberries and sugar in a small saucepan. Bring to a boil over medium heat. Reduce the heat and simmer, stirring occasionally, until the berries are tender and the sauce is thickened, 8-10 minutes. Remove from the heat and let cool completely before using. To make the frozen yogurt, remove the zest and freeze the yogurt mixture in your ice cream maker according to the manufacturer's instructions. 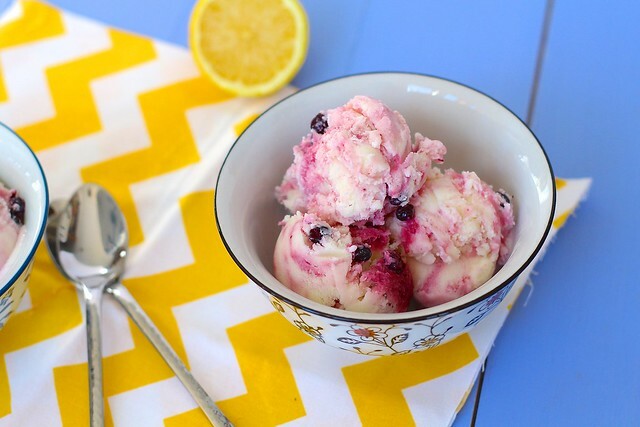 As you pack the frozen yogurt in a container to freeze, swirl in the blueberry sauce.